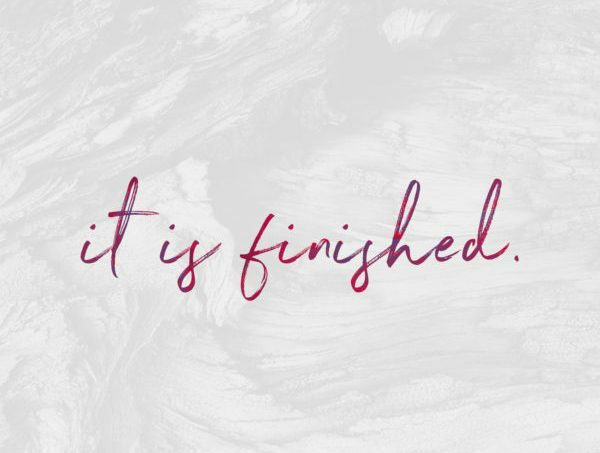 Last week we looked at Jesus’ final words IT IS FINISHED! In Greek it is tetelestai meaning completed, perfected, brought to a close. It was an accounting term used to mark a debt paid in full. As an artist term, it was declared as he stood back and announced: “The picture is perfect” as the artist laid down his brush. On the battlefield, it was a loud cry to lay your weapons down and go home (REST) because the battle/war was finished… FULL and FINAL victory over the enemy! That’s a great question… because if we still believe we are in a battle, then it’s hard to walk in the COMPLETE victory of IT IS FINISHED. Col 2:15 And having spoiled principalities and powers, he made a show of them openly, triumphing over them in it. We quote Colossians 2:15 but do we really believe it? Do we really believe it was a complete victory? That the enemy was completely stripped, rendered powerless and that nothing more is required of us? No battling needed? Realizing and Resting in this FINISHED life that is yours is powerful! He is seated and you are seated… no need to do battle… IT IS FINISHED! Galatians 1:16 he said the message he was to preach was the same thing that God revealed to him… Christ in me! We have always been the “new man” in Christ… never been enslaved to sin… never been dominated by death. We have always been free. Diana was a god made by human hands (Acts 17).. There was nothing real about her. These Ephesians had an extraordinary fear of hostile spiritual powers, religion and magic claimed to offer relief from this oppressive fear and even promised means of control over the dreaded demonic realm. The Roman authorities had absolute rule and even established Emperor worship inside Diana’s temple. It wasn’t a term of endearment but a reminder to the people that Caesar was the one with ultimate authority and rule and the one they owed a debt of loyalty to. and kratos carries the sense of supremacy; refers to manifested power; kra means perfect or complete – finished! ALL of that power IN us…. strength, ability, dynamic miracle working power.. resurrection power…holding power, staying power, possessing power… manifested power, manifested supremacy, complete and finished power!! But in Christ all divisions and barriers have been destroyed (Eph 2:11-14) and ALL have access to the Father at any time. Mirror: I desire that you will draw directly from the source; that the God of our Lord Jesus Christ, the Father of glory ignites the spirit of wisdom and of revelation in you in the unveiling of his Master Plan (His doxa – glory, intent). I desire that you know by revelation what he has known about you all along! (18) I pray that your thoughts will be flooded with light and inspired insight; that you will clearly picture His intent in identifying you in Him so that you may know how precious you are to him. The saints are His treasure and the glorious trophy of His portion! (We are God’s assets and the measure of his wealth!) (19) I pray that you will understand beyond all comparison the magnitude of His mighty power at work IN us who believe. Faith reveals how enormously advantaged we are in Christ. (20) It is the same dynamic energy that He unleashed in Christ when He raised Him from the dead and forever established Him in the power of His own right hand in the realm of the heavens. (21) Infinitely above all the combined forces of rule, authority, dominion or governments; He is ranked superior to any name that could ever be given to anyone of this age or any age still to come in the eternal future. (22) I want you to see this: He subjected all these powers under His feet. He towers head and shoulders above everything. He is the head; (23) the church is His body. The completeness of His being that fills ALL in ALL resides IN US! God cannot make himself more visible or exhibit himself more accurately. The “church” is His redeemed image and likeness in human form. They were seeing the fearful, oppressive armor of these ruling authorities, of these religious idols in the high places – it represented their reputation. Human life was reduced to slavery and the soul-ruled earthly realm through Adam’s fall but is now awakened to lordship in the heavenly realm of spiritual realities through the knowledge of our co-resurrection with Christ. So the only time diabolos is a noun (person, place or thing) is in 3 verses and all are dealing with human behavior – false accusers. He’s saying, acquaint yourself with (put on) all that God’s victory in Christ (God’s whole armor) represents so that you may be able to stand against, not being moved by the deceit of false and slanderous accusations against who you really are. Verse 12 says For we wrestle not against flesh and blood, but against principalities, against powers, against the rulers of the darkness of this world, against spiritual wickedness in high places. I like the Mirror Bible for this verse. The rest of v. 13 says (KJV) and having done all, to stand. Katergazomai is achieved, worked out; brought to a decisive finality! FINISHED!! Let’s read Eph 6:11-13 again in light of those definitions…..
Eph 6:11-13: So, acquaint yourself with ALL that God’s victory in Christ represents (in you, as you and through you) so that you may be able to stand against the deceit of false accusations and false slanders against who you are. That you may be able to oppose and set yourself against any contradiction, because the days of hardships, misery and labor are over! AND stand in this power: ALL, absolutely ALL is FINISHED! God’s armor represents His reputation, His victory defines you! Eph 6:11-17: Fully immerse yourself in the detail and significance of every individual part of the armor of God. (Acquaint yourself with all that God’s victory in Christ represents.) Just like every aspect in a soldier’s armor significantly completes their battle uniform to best equip them to face every 1method and strategy that an 2enemy could possibly employ against them. (12) People are not the enemy (whether they be husbands, wives, children, or parents, slaves, or bosses. They might host hostile, law inspired thought patterns through their unbelief or ignorance) but to target one another is to engage in the wrong combat. We represent the authority of the victory of Christ in the spiritual realm. We are positioned there (in Christ); we target the mind games and structures of darkness, religious thought patterns, governing and conditioning human behavior. (13) It is most important therefore to acquaint yourself with every aspect of God’s armor. You are fully fit to powerfully defeat any onslaught or contradiction on any day of confrontation, triumphantly standing your ground. The days where the law of hardships, annoyances and labor dictated your life are over! (14) Take your position: you have the truth (of who you are in Christ) wrapped around your hips like a soldier’s belt, holding the complete body armor together. Righteousness covers your heart like a bulletproof breastplate. (15) You wear your eagerness and passion to communicate the good news like soldier’s shoes. Announce peace; the battle has already been fought and won (16) It is most important to engage your faith as a man-size shield that covers your whole person and empowers you to extinguish the flame in every arrow of contradiction that you might face. The only visible part of you is your faith! (To co-believe with God protects your whole person, body, soul and spirit.) (17) Pondering redemption realities is your headgear that protects your mind; inspired thoughts give voice to God’s word—this is your spiritual sword. The Mirror says it well and really captures the heart of Ephesians In conclusion, and with reference to the theme and context of this writing I encourage you to realize your strength in the Master; your union with Him is your limitless resource. but for now we’ll just spend one more week on it before jumping into the truth that we are Not Just Healed but WHOLE. So next week we’re going to look at some more “warfare” Scriptures in light of IT IS FINISHED, Christ’s COMPLETE victory, and what God has to say about warfare in Isaiah.